Artwork that changes to suit a viewer’s mood has been created by scientists. The technology, developed by a UK/US team, enables a digital painting to recognise a person’s emotional state and respond accordingly. Angry faces prompt an image with darker colours, applied in violent brush stokes; a happier person will see more vibrant shades, subtly daubed. The team said they hope it would provide an interactive experience for art lovers. The technology, designed by scientists at the University of Bath and the University of Boston, renders any digital photograph to look like a painting. 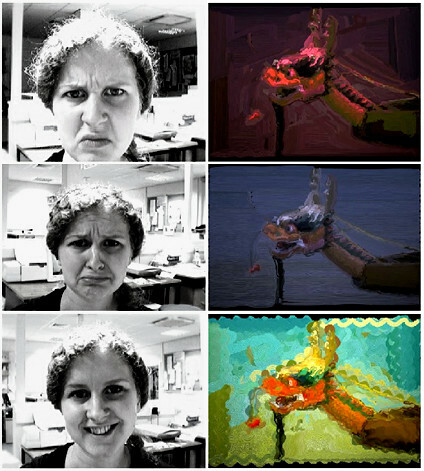 As the artwork is viewed, a webcam positioned just above the picture captures the observer’s face, allowing it to be analysed by a computer program. Checking for key facial features, such as the curl of the mouth, brow furrow and the openness of the eyes, the program can work out the apparent emotional state of the viewer. And in real time, the digital image responds to best suit the mood of the watcher. “With this, a viewer can use facial expression to set the parameters. I think it is a really exciting area – digital photography has really taken off, and there is a market emerging for tools to manage and manipulate digital photos.” The work was recently presented at the Non-Photorealistic Animation and Rendering conference that took place in Annecy, France.